Moswetuset Hummock – we drive by it everyday, but what’s it all about? 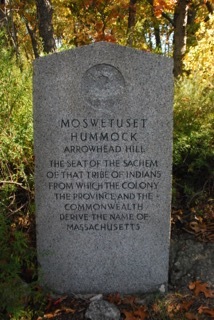 Did you know that the Moswetuset Hummock is one of the oldest recognized historical sites in the nation as well as in the Commonwealth of Massachusetts? The historic Moswetuset Hummock sits on the north end of Wollaston beach overlooking Quincy Bay in eastern Massachusetts. Moswetuset, meaning “shaped like an arrowhead,” was the name of the Native American tribe from which the Commonwealth of Massachusetts derives its name. The thickly-wooded hill was the summer seat of the tribe’s Sachem, Chickatabot, chosen for its view of the surrounding area and proximity to the bay, salt marshes, and the Blue Hills. It was here that Chickatabot met with Myles Standish, of the Plymouth Colony, in 1621 as the colonists began their early trade with the Indians. Thomas Crane Library citation from the Mass. Archaeological Society, Reflections Uopn the Past and Present of the Massachusetts Indians”, Bulletin vol. #4,#3. I have noticed that when looking at Moswetuset from the northern end of Wollaston Beach, when the tide is high and the waters calm, that the combination of the reflection of Moswetuset mirrored with Moswetuset does make the shape of a projectile point or ‘Arrowhead’.